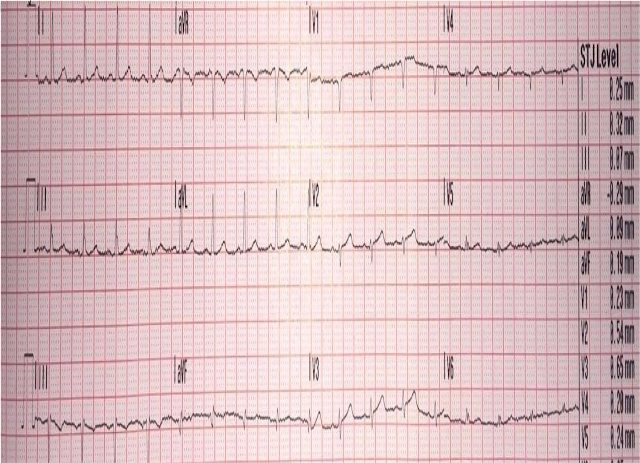 This case comes from Jason Winter, of The Facebook Clinical Electrocardiology ECG Page. A 60-something woman called EMS for chest pain. There is very low voltage in the precordial leads, with a total QRS amplitude of only 3.5 mm in V2 and 4 mm in V3. In spite of this low voltage, there is ST elevation (as measured at the J-point and relative to the PQ junction, and as measured by the computer and shown on the right), of 0.54 mm in V2 and 0.65 mm in V3. The ST/QRS ratios in V2 and V3 are, respectively, 0.154 and 0.162. These are a high ST/QRS ratios. -- 0.215 and 0.195 for V2 and V3 in LAD occlusion vs.
-- 0.077 and 0.081 for V2 and V3 in early repolarization. The specificity of a value in V2 greater than or equal to 0.154 was 90% (90 of 100 cases). The specificity of a value in V3 greater than or equal to 0.162 was 84% (79 of 94 cases). However, we did not include cases with less than 1 mm of ST elevation, so strictly speaking, one should be circumspect about applying such ratios. Nevertheless, these high ratios certainly suggest that there is abnormal ST elevation in the leads of the LAD territory. How about if we apply the LAD occlusion/early repol formula? This produces a value of 24.46 (greater than 23.4 is nearly diagnostic of LAD occlusion). However, again, the formula was developed only in ECGs with at lead 1 mm of STE in V2 and V3, so does it apply? Now one can appreciate the ST elevation a bit better. I don't know if the medics noticed these ECG findings or not, but if not, they recognized the value of serial ECGs in a patient with chest pain. The medics administered aspirin (no Nitroglycerine), and the pain resolved. Because of ST resolution, the patient was not taken that night to the cath lab. She was treated for NonSTEMI with antiplatelet and antithrombotic agents and went to cath the next day, where an where multiple LAD thrombi were found and the lesion will be stented. Waiting to cath a transient STEMI can be hazardous. See this case in which I made that mistake. 1. Repolarization (ST-T) is proportional to depolarization. All ST elevation (and T-wave size) should be assessed relative the QRS amplitude. 2. Serial ECGs improve the sensitivity of ST elevation on the ECG for MI. In the only ED study of its kind, sensitivity increased from 46% to 62%. - It is still the rule: max T-wave amplitude < 2/3 QRS amplitude ? merci Steve, always brilliant ! "max T-wave amplitude < 2/3 QRS amplitude"
à l'amplitude du QRS (maximum inférieur aux 2/3 du complexe QRS)"
Anyone else notice the limb lead misplacement? Left leg and left arm electrodes have been switched. I don't see it. Axis is normal. Why do you say so? Lead III shouldn't have negative P, QRS and T. Lead aVL doesn't usually have a more strongly positive P, QRS and T as compared to aVF. We often do this switch on purpose to test students. 1) It starts with the History! The patient is a 60yo woman who calls EMS for chest pain. Even before looking at her ECG — that’s enough to greatly increase her risk of having something! 2) The Q waves with minimal nonspecific ST-T wave findings in leads III and aVF really aren’t helpful in this case. This may or may not indicate prior inferior infarction. The shallow T inversion in lead III may simply be due to predominant negativity in this lead — so NO help from the limb leads on this case. 3) In addition to ST-T wave proportionality (as emphasized by Dr. Smith) — relative QRS progression/change in amplitude IS also helpful here! Note that R wave amplitude tails off from V3 — instead of progressively increasing in leads V4,V5 as expected. That is not normal — and this finding should heighten your suspicion that the subtle T wave prominence we see is real. Loss of forces (ie, paradoxically decreasing R wave amplitude across chest leads) — may be another finding of anterior infarction in progress. What also struck me was in the progression was the notable attenuation of the S waves in V2 and V3, even in the presence of low voltage, followed by terminal QRS distortion. I don't see the terminal QRSD. There are S-waves in both V2 and V3. V3 in ECG#3, no J wave, no S wave right? Dave, I see what you mean. I thought you were referring to the first EKG. Yes, indeed, terminal QRS distortion develops over time. Nice observation. One important fact I have leant over the years, is that the ECG machine is good for capturing evidence out on the road for hospital staff, it's important for pre-hospital personnel to capture serial ECG's like these here, if only one ECG was recorded in this case, then findings like this would have be easily missed to the untrained eye. Does it really matter about mm? 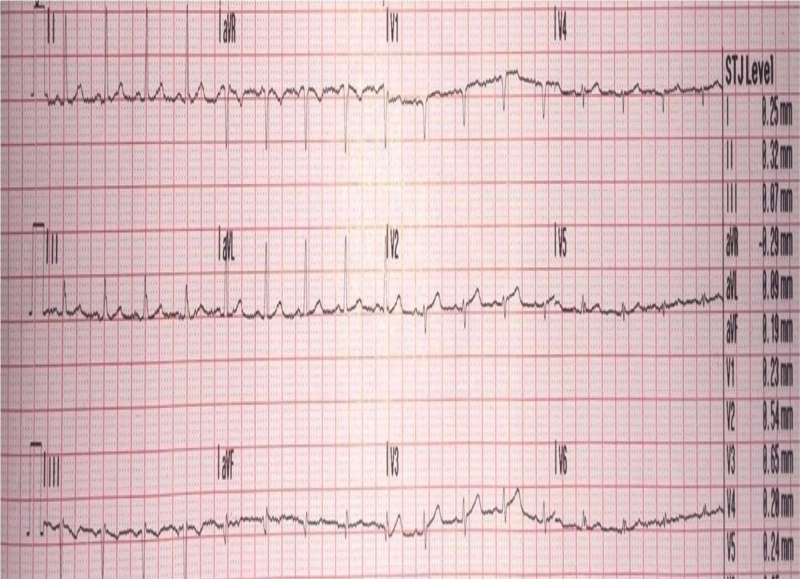 the first ECG shows STEMI morphology in my mind, its does not meet AHA STEMI criteria, but when you are presented with a patient that looks like they are having a MI, its only a split second to hit the record button on the ECG machine to monitor ST segments, and to record a ECG that the cath lab might accept. I feel we need to train pre-hospital staff better in electrocardiology interpretation, and also look at continuous ECG recording systems for chest pain patients on ambulances, linked to cardiology department or ED to get the best care for patients, it's frustrating for ambulance staff when the cath lab refuses your patient based on mm, or its not a obvious barn door MI on the ECG, maybe we should look for a better system for the future of cardiac care. I'm a monitor tech in an ER and one of our physicians challenged me to learn 12-lead ECG's to lend another set of eyes. It was suggested that I read this site and have been hooked since (~2 years). Thank you for the cases and - most importantly - the detailed explanations. The value of serial ECG's cannot be overemphasized!!! Another case to learn from. "The specificity of a value in V2 greater than or equal to 0.154 was 90% (9 of 100 cases)." Maybe 90 of 100 cases? Or did I miss something? Thanks for picking up the typo! Corrected. I'm so glad it's made a difference for you! What is this? A Perplexing ECG. Where is the lesion in this STEMI?